Penrose--the place for red rock views from every room! Situated high on the side of one red rock formation, looking across to two more famous Sedona rocks only half a mile away, the Penrose is noted for its breathtaking scenery. Five luxury guest rooms in the recently completed home of two Big-10 profs, feature private balconies, double jacuzzis or double walk-in showers, DVD players, gourmet breakfasts, bedtime treats, fresh-squeezed orange juice, and more. Rates $175-$210. Conveniently located close to golfing, hiking, biking, shopping, galleries, and restaurants; yet in a quiet residential neighborhood only a couple of hours drive from the Grand Canyon and the many ancient Indian ruins and geographical wonders in between. Enjoy all that the area has to offer or just relax at The Penrose. 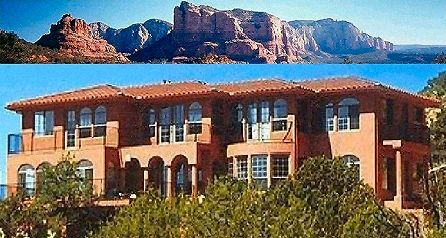 Our minimalist decor with a Spanish and Native American flavor provide a serene setting for soaking up the awesome grandeur of the red rocks. This and other Bed and Breakfast Inns can be found here online in The Register. Romantic Country Inns, Getaways and B&Bs offer a great lodging alternative to big hotels. A warm comfortable bed and a tasty breakfast can make for a great vacation or business travel day!